Create repeatable breath patterns at a high level of accuracy with the ASL 5000™ Breathing Simulator’s SmartPump mode. The SmartPump mode is a waveform generator that controls flow or volume. Sometimes you do not need a patient model that responds to pressure changes. Rather, you need a flow or volume pattern representing just the spontaneous breathing activity. For this purpose, you can switch to SmartPump Mode instead of a one- or two-compartment lung model. Sinusoidal, trapezoidal, or any other waveform can be programmed from within the software or imported, thus providing virtually any common or unique breath pattern needed. Because the smart pump is driven by an electromechanical system with a volume resolution of less than 13 μL, it is extremely accurate and repeatable, even when providing very small volumes or very low flow rates. 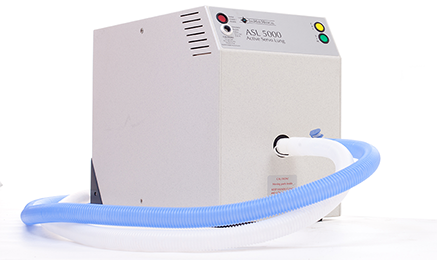 Learn more about the ASL 5000 Breathing Simulator.